More people would benefit from Charlie if his thoughts were more accessible and if he was as prolific a writer as he is a reader. The best way by far to know Charlie is to read Poor Charlie’s Almanack. “Warren and I avoid doing anything that someone else at Berkshire can do better. “I’d rather throw a viper down my shirt front than hire a compensation consultant. It is easy to have fair compensation systems, but about half of companies have grossly unfair systems in which the top people get paid too much. “Many markets get down to two or three big competitors—or five or six. And in some of those markets, nobody makes any money to speak of. But in others, everybody does very well. Over the years, we’ve tried to figure out why the competition in some markets gets sort of rational from the investor’s point of view so that the shareholders do well, and in other markets, there’s destructive competition that destroys shareholder wealth. If it’s a pure commodity like airline seats, you can understand why no one makes any money. As we sit here, just think of what airlines have given to the world—safe travel, greater experience, time with your loved ones, you name it. Yet, the net amount of money that’s been made by the shareholders of airlines since Kitty Hawk, is now a negative figure—a substantial negative figure. Competition was so intense that, once it was unleashed by deregulation, it ravaged shareholder wealth in the airline business. Yet, in other fields—like cereals, for example—almost all the big boys make out. If you’re some kind of a medium grade cereal maker, you might make 15% on your capital. And if you’re really good, you might make 40%. But why are cereals so profitable—despite the fact that it looks to me like they’re competing like crazy with promotions, coupons and everything else? I don’t fully understand it. Obviously, there’s a brand identity factor in cereals that doesn’t exist in airlines. That must be the main factor that accounts for it. And maybe the cereal makers by and large have learned to be less crazy about fighting for market share—because if you get even one person who’s hell-bent on gaining market share…. For example, if I were Kellogg and I decided that I had to have 60% of the market, I think I could take most of the profit out of cereals. I’d ruin Kellogg in the process. But I think I could do it. “The human mind is a lot like the human egg, and the human egg has a shut-off device. When one sperm gets in, it shuts down so the next one can’t get in. … And of course, if you make a public disclosure of your conclusion, you’re pounding it into your own head. “Of course I’m troubled by huge consumer debt levels – we’ve pushed consumer credit very hard in the US. Eventually, if it keeps growing, it will stop growing. As Herb Stein said, “If something cannot go on forever, it will stop.” When it stops, it may be unpleasant. Other than Herb Stein’s quote, I have no comment. But the things that trouble you are troubling me. “Everyone caved, adopted loose [accounting] standards, and created exotic derivatives linked to theoretical models. As a result, all kinds of earnings, blessed by accountants, are not really being earned. When you reach for the money, it melts away. It was never there. It [accounting for derivatives] is just disgusting. It is a sewer, and if I’m right, there will be hell to pay in due course. All of you will have to prepare to deal with a blow-up of derivative books. “The stupid and dishonest accountants allowed the genie of totally inappropriate accounting to descend on derivatives books. And once this has happened – people get status, etc. – it’s impossible to get it back into the bottle. “People don’t think about the consequences of the consequences. People start by trying to hedge against interest rate changes, which is very difficult and complicated. Then, the hedges made the results [reported profits] lumpy. So then they use new derivatives to smooth this. Well, now you’ve morphed into lying. This turns into a Mad Hatter’s Party. This happens to vast, sophisticated corporations. Somebody has to step in and say, “We’re not going to do it — it’s just too hard… Derivatives are full of clauses that say if one party’s credit gets downgraded, then they have to put up collateral. It’s like margin – you can go broke. In attempting to protect themselves, they’ve introduced instability. Nobody seems to have recognition of what a disaster of a system they’ve created. It’s a demented system. “The Berkshire-style investors tend to be less diversified than other people. The academics have done a terrible disservice to intelligent investors by glorifying the idea of diversification. Because I just think the whole concept is literally almost insane. It emphasizes feeling good about not having your investment results depart very much from average investment results. But why would you get on the bandwagon like that if somebody didn’t make you with a whip and a gun? “Economists get very uncomfortable when you talk about virtue and vice. It doesn’t lend itself to a lot of columns with numbers. But I would argue that there are big virtue effects in economics. I would say that the spreading of double-entry bookkeeping by the Monk, Fra Luce de Pacioli, was a big virtue effect in economics. It made business more controllable, and it made it more honest. “Here’s one truth that perhaps your typical investment counselor would disagree with: if you’re comfortably rich and someone else is getting richer faster than you by, for example, investing in risky stocks, so what?! Someone will always be getting richer faster than you. This is not a tragedy. It’s a good habit to trumpet your failures and be quiet about your successes. “Our investment style has been given a name — focus investing — which implies 10 holdings, not 100 or 400. Focus investing is growing somewhat, but what’s really growing is the unlimited use of consultants to advise on asset allocation, to analyze other consultants, etc. “You’ll find many markets where bottlers of Pepsi and Coke both make a lot of money and many others where they destroy most of the profitability of the two franchises. That must get down to the peculiarities of individual adjustment to market capitalism. I think you’d have to know the people involved to fully understand what was happening. “Berkshire in its history has made money betting on sure things. If you have the opportunities of Berkshire, an investment in gold is dumb. “In engineering, people have a big margin of safety. But in the financial world, people don’t give a damn about safety. They let it balloon and balloon and balloon. It’s aided by false accounting. “Even in pure mathematics they can’t remove all paradox, and the rest of us should also recognize we are going to have to endure a lot of paradox, like it or not. For some odd reason, I had an early and extreme multidisciplinary cast of mind. I couldn’t stand reaching for a small idea in my own discipline when there was a big idea right over the fence in somebody else’s discipline. So I just grabbed in all directions for the big ideas that would really work. Nobody taught me to do that; I was just born with that yen. “Since mistakes of omission don’t appear in the financial statements, most people don’t pay attention to them. We rub our noses in mistakes of omission – as we just did. After nearly making a terrible mistake not buying See’s, we’ve made this mistake many times. We are apparently slow learners. These opportunity costs don’t show up on financial statements, but have cost us many billions. There’s no way that you can live an adequate life without [making ] many mistakes. “It’s my guess that something like 5% of GDP goes to money management and its attendant friction. I define it broadly – annuities, incentive pay, all trading, etc. Nobody else has used figures that high, but that’s my guess. Worst of all, the people doing this are among the best and the brightest. Hundreds and thousands of engineers, etc. are going into hedge funds and investment banking. That is not an intelligent allocation of the brainpower of the civilization. I think money management is a low calling relative to being a surgeon. I don’t like the percentage of our GDP and brainpower and professional effort that’s in money management. I don’t think it’s a good thing for our country, and don’t expect it to end well. The present era has no comparable precedent in the history of capitalism when so many people are trading pieces of paper. We have a higher proportion of the intelligent sections of society involved in buying and selling bits of paper and trying to make money doing it. There are more people doing this than at any time in history. A lot of this reminds me of Sodom and Gomorrah. The general systems of money management [today] require people to pretend to do something they can’t do and like something they don’t. It’s a terrible way to spend your life, but it’s very well paid. In investment management today, everybody wants not only to win, but to have a yearly outcome path that never diverges very much from a standard path except on the upside. Well, that is a very artificial, crazy construct. That’s the equivalent in investment management to the custom of binding the feet of Chinese women. I think a select few—a small percentage of the investment managers—can deliver value added. But I don’t think brilliance alone is enough to do it. I think that you have to have a little of this discipline of calling your shots and loading up—you want to maximize your chances of becoming one who provides above average real returns for clients over the long pull. But I’m just talking about investment managers engaged in common stock picking. I am agnostic elsewhere. I think there may well be people who are so shrewd about currencies and this, that and the other thing that they can achieve good long term records operating on a pretty big scale in that way. But that doesn’t happen to be my milieu. I’m talking about stock picking in American stocks. The whole concept of the house advantage is an interesting one in modern money management. The terms of the managers of the private partnerships look a lot like the take of the croupier at Monte Carlo, only greater. Once you start doing something bad, then it’s easy to take the next step – and in the end, you’re a moral sewer. We believe there should be a huge area between everything you should do and everything you can do without getting into legal trouble. I don’t think you should come anywhere near that line. We don’t deserve much credit for this. It helps us make more money. I’d like to believe that we’d behave well even if it didn’t work. But more often, we’ve made extra money from doing the right thing. Ben Franklin said I’m not moral because of it’s the right thing to do – but because it’s the best policy. We don’t claim to have perfect morals, but at least we have a huge area of things that, while legal, are beneath us. We won’t do them. Currently, there’s a culture in America that says that anything that won’t send you to prison is OK. It is not always recognized that, to function best, morality should sometimes appear unfair, like most worldly outcomes. The craving for perfect fairness causes a lot of terrible problems in system function. Some systems should be made deliberately unfair to individuals because they’ll be fairer on average for all of us. I frequently cite the example of having your career over, in the Navy, if your ship goes aground, even if it wasn’t your fault. I say the lack of justice for the one guy that wasn’t at fault is way more than made up by a greater justice for everybody when every captain of a ship always sweats blood to make sure the ship doesn’t go aground. Tolerating a little unfairness to some to get a greater fairness for all is a model I recommend to all of you. The cash register did more for human morality than the Congregational Church. It was a really powerful phenomenon to make an economic system work better, just as, in reverse, a system that can be easily defrauded ruins a civilization. A system that’s very hard to defraud, like a cash register, helped the economic performance of a civilization by reducing vice, but very few people within economics talk about it in those terms. “The life of Darwin demonstrates how a turtle may outrun a hare, aided by extreme objectivity, which helps the objective person end up like the only player without a blindfold in a game of Pin the Tail on the Donkey. The general assumption is that it must be easy to sit behind a desk and people will bring in one good opportunity after another — this was the attitude in venture capital until a few years ago. This was not the case at all for us — we scrounged around for companies to buy. For 20 years, we didn’t buy more than one or two per year. …It’s fair to say that we were rooting around. There were no commissioned salesmen. Anytime you sit there waiting for a deal to come by, you’re in a very dangerous seat. If you take the best text in economics by Mankinaw, he says intelligent people make decisions based on opportunity costs — in other words, it’s your alternatives that matter. That’s how we make all of our decisions. The rest of the world has gone off on some kick — there’s even a cost of equity capital. A perfectly amazing mental malfunction. Finding a single investment that will return 20% per year for 40 years tends to happen only in dreamland. In the real world, you uncover an opportunity, and then you compare other opportunities with that. And you only invest in the most attractive opportunities. That’s your opportunity cost. That’s what you learn in freshman economics. The game hasn’t changed at all. That’s why Modern Portfolio Theory is so asinine. “[GEICO] got to thinking that, because they were making a lot of money, they knew everything. And they suffered huge losses. All they had to do was to cut out all the folly and go back to the perfectly wonderful business that was lying there. “When you have a huge convulsion, like a fire in this auditorium right now, you do get a lot of weird behavior. If you can be wise [during such h times, you’ll profit]. We just throw some decisions into the “too hard” file and go onto others. “It’s amazing how few times over the decades we’ve have to remove a person — far less than other companies. It’s not that we’re soft or foolish, it’s that we’re wiser and luckier. Most people would look back and say their worst mistake was not firing someone soon enough. “I always like it when someone attractive to me agrees with me, so I have fond memories of Phil Fisher. The idea that it was hard to find good investments, so concentrate in a few, seems to me to be an obviously good idea. But 98% of the investment world doesn’t think this way. “Those of us who have been very fortunate have a duty to give back. Whether one gives a lot as one goes along as I do or a little and then a lot [when one dies] as Warren does is a matter of personal preference. I would hate to have people ask me for money all day long. “The investment game always involves considering both quality and price, and the trick is to get more quality than you pay for in price. It’s just that simple. “We’re the tortoise that has outrun the hare because it chose the easy predictions. And he knew that the huge productivity increases that would come from a better machine introduced into the production of a commodity product would all go to the benefit of the buyers of the textiles. Nothing was going to stick to our ribs as owners. That’s such an obvious concept—that there are all kinds of wonderful new inventions that give you nothing as owners except the opportunity to spend a lot more money in a business that’s still going to be lousy. The money still won’t come to you. All of the advantages from great improvements are going to flow through to the customers. Conversely, if you own the only newspaper in Oshkosh and they were to invent more efficient ways of composing the whole newspaper, then when you got rid of the old technology and got new fancy computers and so forth, all of the savings would come right through to the bottom line. In all cases, the people who sell the machinery—and, by and large, even the internal bureaucrats urging you to buy the equipment—show you projections with the amount you’ll save at current prices with the new technology. However, they don’t do the second step of the analysis which is to determine how much is going stay home and how much is just going to flow through to the customer. I’ve never seen a single projection incorporating that second step in my life. And I see them all the time. Rather, they always read: “This capital outlay will save you so much money that it will pay for itself in three years.” So you keep buying things that will pay for themselves in three years. And after 20 years of doing it, somehow you’ve earned a return of only about 4% per annum. That’s the textile business. And it isn’t that the machines weren’t better. It’s just that the savings didn’t go to you. The cost reductions came through all right. But the benefit of the cost reductions didn’t go to the guy who bought the equipment. It’s such a simple idea. It’s so basic. And yet it’s so often forgotten. Then there’s another model from microeconomics which I find very interesting. When technology moves as fast as it does in a civilization like ours, you get a phenomenon which I call competitive destruction. You know, you have the finest buggy whip factory and all of a sudden in comes this little horseless carriage. And before too many years go by, your buggy whip business is dead. You either get into a different business or you’re dead—you’re destroyed. It happens again and again and again. And when these new businesses come in, there are huge advantages for the early birds. And when you’re an early bird, there’s a model that I call “surfing”—when a surfer gets up and catches the wave and just stays there, he can go a long, long time. But if he gets off the wave, he becomes mired in shallows…. “We both insist on a lot of time being available almost every day to just sit and think. That is very uncommon in American business. We read and think. So Warren and I do more reading and thinking and less doing than most people in business. We do that because we like that kind of a life. But we’ve turned that quirk into a positive outcome for ourselves. “This room contains many people pretty well stricken by expired years — in my generation or the one following. We tend to believe in thrift and avoiding waste as good things, a process that has worked well for us. It is paradoxical and disturbing to us that economists have long praised foolish spending as a necessary ingredient of a successful economy. Munger: You say there is some vaguely established view in economics as to what is an optimal dividend policy or an optimal investment? Professor William Bratton of the Rutgers-Newark School of Law: I think we all know what an optimal investment is. Munger: No, I do not. At least not as these people use the term. Bratton: I don’t know it when I see it but in theory, if I knew it when I saw it this conference would be about me and not about Warren Buffett. 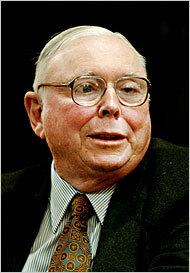 Munger: What is the break point where a business becomes sub-optimal or when an investment becomes sub-optimal? Bratton: When the return on the investment is lower than the cost of capital. Munger: And what is the cost of capital? Munger: Well, it’s only fair, if you’re going to use the cost of capital, to say what it is. Bratton: I would be interested in knowing, we’re talking theoretically. Munger: No, I want to know what the cost of capital is in the model. Bratton: In the model? It will just be stated. Munger: Where? Out of the forehead of Job or something? Munger: Well, some of us don’t find this too satisfactory. Bratton: I said, you’d be a fool to use it as a template for real world investment decision making. We’re only trying to use a particular perspective on human behavior to try to explain things. Munger: But if you explain things in terms of unexplainable sub-concepts, what kind of an explanation is that? Bratton: It’s a social science explanation. You take for what it’s worth. Munger: Do you consider it understandable for some people to regard this as gibberish? Bratton: Perfectly understandable, although I do my best to teach it. Munger: Why? Why do you do this? Bratton: It’s in my job description. Munger: Because other people are teaching it, is what you’re telling me.